The exterior of the Sonoma house is handsome, but the interiors are prosaic. For $2.6M, one should get more. Meanwhile, a truly wonderful MCM, inside and out, of old-growth pine costs a mere $510K, and can't sell! You can't find a 2-bedroom condo for that amount in LA. They just can't help themselves, can they: if it's modern, it must have been inspired by Wright. Nothing could be less Wrightian than rows of bright white sheet-rocked cells with punched windows . . . The Atlanta house is nice enough in its way. I am always comforted by window walls in which an implied wainscot is created by a waist-high horizontal muntin or mullion. Cliff May's prefabs had that feature to their many glazed doors, and I am also reminded of Mies, though his glazing division is generally lower than this, I think. Yet another melange of fact and fiction -- or half-truth -- about Wright's most famous building. But here's a question I can't answer: is the concrete at Fallingwater "covered in stucco" ? I suppose the lack of texture or even of formwork joints means that there must be more just paint on those surfaces . . . Seems like a really good question to me. Wonder what others on the forum have to say. (aside: the article contains the trope that Wright designed FW in a single morning. His whole career up to that point was behind that building. Here is a world historical genius with decades of experience sitting down to draw. It troubles me to see "journalism" of this sort, published anywhere. Was popular-culture periodical journalism always this lax ? I suppose it might have been. We know what to expect from the supermarket check-out tabloids; encountering the word "architecture," though, leads me to expect more, as if serious art was being discussed seriously. But the personal blog -- no matter the presentation, now that anyone can plug into a site-builder and "print professionally" -- is clearly not edited by anyone but the sole proprietor -- and I've come to expect less from the sole proprietor than from the partnership when it comes to editing and conferring . . . in any phase or department of a going concern ? According to the website (Fallingwater.org), the concrete is indeed coated with stucco. I won't be adamant, because I cannot find the issue of Scientific American that published the article about the restoration of FW, but I believe the exterior was not coated with stucco. Rather, the basic structural elements were poured concrete, and a second layer of concrete of a slightly different density was troweled over to make the surface less 'brut.' (One can imagine that pouring those gently rounded edges would have been close to impossible.) It is the difference between the compositions of the two materials that caused some of the problems FW has had over the years. This may be comparing Granny Smith and Fuji, but the smooth texture of the FW surfaces suggest that there is a difference between the concrete used for the finish and stucco. I skimmed the article and could not find reference to how the concrete was finished. accurately about their subject, whatever it may be. 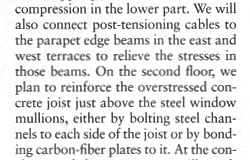 mullions, a likely scenario explaining the error that may have been made at Taliesin, and the extent of the invisible repairs that were made. 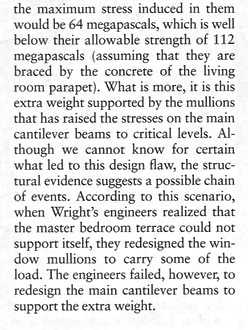 assumes that Mr Wright did not initially conceive of the structural function of those mullions, an idea I find hard to accept. No, that isn't the article. There is an article in some periodical that shows a cross-section of a terrace wall with the two applications of concrete. I will have to scour my library for it. "The rounded tops of parapets were formed of a cement and sand blend, applied by hand after the wall had cured. This “cold joint,” where the two applications meet, has resulted in long irregular cracking that also served as an entrance point for water to seep between the concrete walls and its finish stucco coat." If accurate, a coating of stucco would be the logical solution to create a visually seamless transition between materials of the parapet top and walls... cold joint cracking not-withstanding. Does anyone make stucco with, say, glass fibers in the mix ? Or is it asking too much of a coating to encase underlying material and keep it in place . . . Yet, another new use of the word 'Usonian'.